As Mandela supporters send their prayers, politicians are vying for political advantage by proving they have close ties with him. Youths hold a candle as they pay their respects outside the Medi-Clinic Heart Hospital, where ailing former South African President Nelson Mandela is being treated, in Pretoria July 1. They arrived by the hundreds, spilling out of buses dressed in the green and gold of South Africa’s ruling party, the African National Congress, and carrying signs calling for the swift recovery of former South African President Nelson Mandela. But as the crowd of well-wishers began to swell near the Pretoria hospital where Mr. Mandela lies is being cared for, its character took on a sharp political edge. Visitors waved ANC flags and sang anti-apartheid protest songs. Volunteers passed out T-shirts bearing the slogan, “There is no born-free without a liberator. Vote ANC 2014,” and a truck rumbled by emblazoned with a massive image of the country’s current president and ANC party leader, Jacob Zuma. But when it comes to Mandela, grief and politics are difficult to disentangle. The ailing former president is the ruling party’s most venerable face, a living reminder of its central role in bringing segregation to its knees and ushering in a new era of democracy and racial reconciliation. He commands a kind of unifying respect unparalleled in American politics, the rare figure behind whom citizens of nearly every political stripe in this rowdy democracy can rally. And with South Africans preparing to go to the polls next year to decide whether or not to give Mandela’s party another term in office, his legacy has taken on a pressing political importance. Mr. Zuma took pains to draw connections between his administration and the Mandela presidency as he met with President Obama on Saturday in South Africa. However, attempts to draw connections between the moral stature of Mandela and the present-day ANC – muddied by accusations of corruption and mismanagement – have not been universally well received. In May, a wide variety of critics blasted Zuma for using Mandela to boost his own political standing after a state television station broadcast footage of him and other party leaders visiting the former president in his Johannesburg home. In the video, the visitors circle the room, laughing and chatting as they snap photographs and clasp Mandela’s hands. All the while, Mandela sits rigidly and stares straight forward in silence, his expression slack and unchanging. "I honestly cannot put in words how hurt the family was” by the decision to air the footage, Winnie Madikizela-Mandela, the former president’s ex-wife, told Britain's ITV News Sunday. "It was insensitive, it compromised the family, compromised his dignity, and it should have never been done." 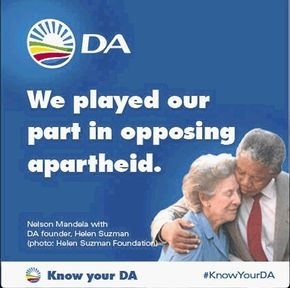 “The attempt by DA to appropriate Nelson Mandela as an icon with no political identity but a neutral person who can be in a poster of any political party is a clear desperate propaganda attempt,” wrote ANC leader Gwede Mantashe. There is, however, another voice rising in the political conversation about Mandela’s legacy – that of the country’s youth. For the first time in next year’s election, there will be voters who were not alive to see Mandela released from prison in 1990, or to watch the wrenching political violence that shook the country as it transitioned to majority rule. These "born frees” grew up in a South Africa where apartheid, and the leaders who fought it, are historical figures rather than contemporaries.